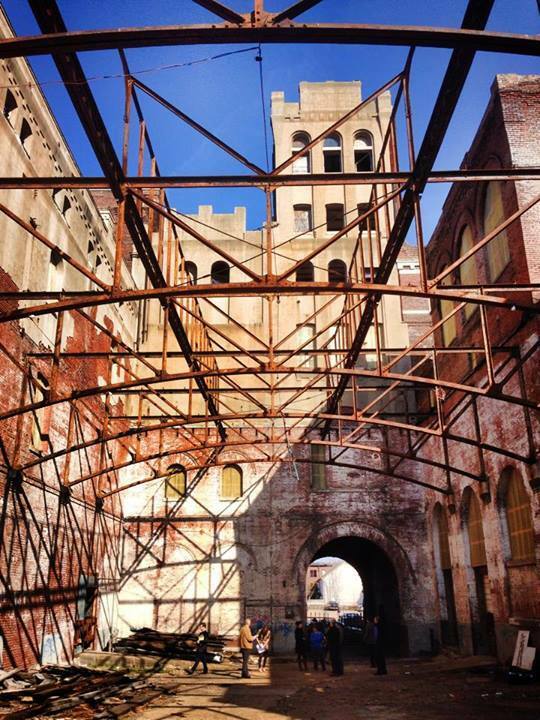 The historic Tennessee Brewery in Memphis.I’m agnostic when it comes to historic preservation. I’m going to start with that because, for some people, historic preservation is a near religious belief. For others, it matters not at all. I don’t see this issue so black and white, which often puts me in the dangerous and confusing middle, a place where insight intersects with reason to form thoughts that are, unfortunately, often incoherent, if not totally offensive, to those that care about this issue far more than I do. Let’s start with two observations that I find to be quite obvious. First, the United States has built very little that is either historic or worth saving. This becomes all the more true the further west one travels. Not only are we a young country – at least the western building style portion – and thus have not had a lot of opportunity to build things that a laymen today would consider “historic” but most of what we built that would potentially be historic was built out of non-enduring materials, generally wood. It is tough to “preserve” something quite prone to deterioration. My second observation is a reaction to the first: because we have so few historic buildings, it should be a priority to maintain and restore those we have. I don’t believe this out of a sense of sentimentality – although I don’t fault people who do – but from an understanding of what these buildings mean to the health of a community. A city without historic buildings is like a family with no parents or grandparents; the children aren’t doomed, but there is a lot there to overcome. My hometown of Brainerd, Minnesota, is the quintessential example of a place that has diminished itself beyond repair by not protecting its historic buildings. Of the 34 structures on the city’s historic downtown tour, only 13 remain. The ones taken down in my lifetime – entirely by choice – include two beautiful theaters and the armory building. The character of the latter was paid homage to by the choice of brick that was used to clad the front of the strip mall that now sits on the site. No joke. Even today, the local school board is rushing to demolish a 1939 neighborhood school building – raze it to the ground – for no other reason than that they can’t figure out what to do with it. They built a new, modern campus school way outside out the city and now bus kids out there leaving this historic building behind. Structurally it is sound (of course), but it does present challenges. [School district business director Steve Lund] said the three-sto­ry school in­cludes only eight class­rooms, has no el­e­va­tor for dis­a­bled stu­dents and needs asbestos a­bate­ment. Dem­o­li­tion bids came in rang­ing from $160,000 to $225,000. When such a lack of imagination among our leadership combines with an outright disregard of our heritage the obvious result should be outrage. What we do with that outrage becomes the more difficult question. I don’t know what to do to save this school from the fate of so many great buildings before it, but I can tell you some things that aren’t helping. Let’s take the school official’s statement – the need for an elevator and asbestos abatement – and start there. This is the primary justification for taking down the building; it is just going to be too costly to renovate for anyone wanting to use it. It is easier to tear it down and start over where you can meet all the codes and requirements. Historic preservation advocates argue that many historic buildings are exempt from these requirements, but that is only partially true and only when a building gets an official historic designation, which itself is not a simple process. Thus, many buildings that could be saved – and should be saved – are pinched between the onerous costs of upgrading to meet modern facility standards and the burdensome process of getting historically designated. Tearing the building down suddenly becomes the path of least resistance. Preservationists do their cause no favors when they, as part of their designation process, insist that historic buildings be placed under glass in a condition of near stasis. This may work for a handful of developers and wealthy benefactors – a disproportionately large percentage of all applicants for preservation credits – but for a local non-profit or a small business looking to save and repurpose a building, the lack of flexibility can be fatal to a project. In the past few months I’ve run into two great examples of a non-traditional approach to historic preservation, both in the private sector. The first is in the amazing little town of Water Valley, Mississippi, where I saw reclaimed building after reclaimed building salvaged from the scrap heap and put back into productive use. Water Valley has been so successful with this it attracted the attention of the NY Times. When I was there in November they had started in on another, an old brick building where the roof had been caved in for years. There are few places where a building like this wouldn’t simply be torn down, but they are both frugal and scrappy in Water Valley, characteristics all our cities would do well to adopt. The other is in Memphis where the Tennessee Brewery building – a gorgeous, seven-story brick building that has sat empty for more than a decade – was put back into operation for just six weeks. All the regulations and tax incentives forced whoever was going to fix up the building to deal with all seven stories at once. Even for a rising city like Memphis, there was no way this was going to work, the burden of filling that much space in a short period of time simply too great. The building was slated to be torn down, bare ground easier for the owners to sell, when a group stepped in with the idea to get things going just on the first story, leaving everything else for later. (Out of respect for those involved, I won’t dwell on the number of code issues they received exemptions or winks on.) The results were beautifully documented by Gracen Johnson. So in the end, I find myself often with the historic preservationists in thought, if not in deed. If we want to save our historic buildings, we need to make doing so a lot easier. Incremental maturing is the natural, healthy state for a strong community. This means that we won’t put historic buildings under glass – preserving them as museum pieces – but instead acknowledge that they need to adapt, evolve and grow along with us. If we do that, we’ll have far more effective means to honor our ancestors and create a multi-generational legacy for those that will inherit our world.